Yahoo! China pasted a "most wanted" poster across its homepage today in aid of the police's witch-hunt for 24 Tibetans accused of taking part in the recent riots. MSN China made the same move, although it didn't go as far as publishing the list on its homepage. UPDATE 1 : We spotted these photos on MSN and Yahoo! on March 21st at 3.30pm (Beijing time). This article was published at 5pm. The photos have been removed from the portals between 8pm and 10pm. UPDATE 2 (24.03.08 / 10.15am Paris time) : Following this report, Yahoo! sent us the following statement :"Contrary to media reports, Yahoo! Inc. is not displaying images on its web sites of individuals wanted by Chinese authorities in connection with the recent unrest in Tibet." In this statement, Yahoo! says that the parent company Yahoo Inc did not publish these images. The company does not deny that Yahoo! China has published the "wanted" posters. This is a common line of defence by Yahoo!, which tries to put the entire responsibility of its Chinese operations on its Chinese partner Alibaba. See bellow a printscreen of the Yahoo! 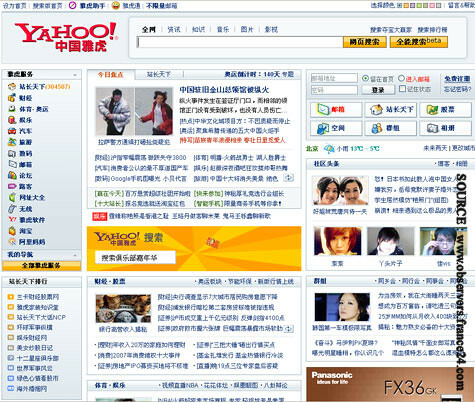 China (cn.yahoo.com) home page on March 21st. Photos of the rioters posted on Yahoo. We blurred out the faces of the rioters to protect their identities. Originally they were not blurred out. The "most wanted" poster has been published on several Chinese portals like Sina.com and news.qq.com. It reads "The Chinese police have issued a warrant for the arrest of suspected rioters in Tibet" and provides a phone number for informants to use in total anonymity. Along with the text are photos of Tibetans taken during the riots. Of the 24 on the list, two have already been caught. Yahoo! 's human rights values have been under fire since it was revealed that the company helped the Chinese police in its inquiry over the journalist Shi Tao, who had an email account with Yahoo. He was sentenced to ten years in prison in 2005 for "divulging state secrets". After that case, it was also found out that Yahoo had provided evidence against at least three other Chinese dissidents. Following the allegations, the company had to offer an explanation to the American congress. It defended itself by explaining that the management of its operational arm in China had been delegated to Alibaba. China, which has blocked access to YouTube since the beginning of the riots, is known for having a sophisticated censorship system when it comes to the internet. This event shows that the Chinese authorities are also using the web to root out their opponents, and once again,with the help of a foreign company.